BELIZE CITY, Tue. Apr. 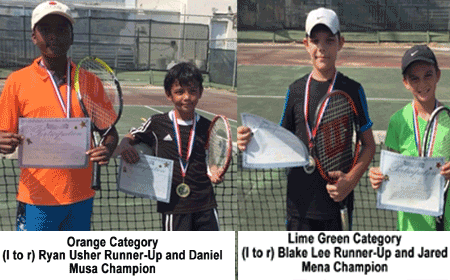 26, 2016–Thirty Eight (38) junior tennis players competed this weekend at the Pickwick Club Tennis Courts, but this time in the red, orange and lime green categories, respectively. In the lime green category, Blake Lee played Alex Musa, and Jared Mena played Nisani Mendez in the semifinals, having scored four highest in the round robin. Jared Mena and Blake Lee made it to the finals, with Mena taking the victory over Lee, 4-2. In the orange category, Daniel Musa and Ryan Usher topped the round robin, and in the finals, Musa defeated Usher, 15-9, to take the victory. The red category had twenty (20) kids, hailing from St. Mary’s Primary School, Horizon Academy, Hummingbird Elementary School and Belize Elementary School. They competed by teams, and the kids showed the fans and their parents all that they are learning in the tennis programs in their respective schools, with help from the Belize Tennis Association. All the children showed vast improvement and excellent tennis skills, and are encouraged to keep on practicing for the upcoming tournaments.